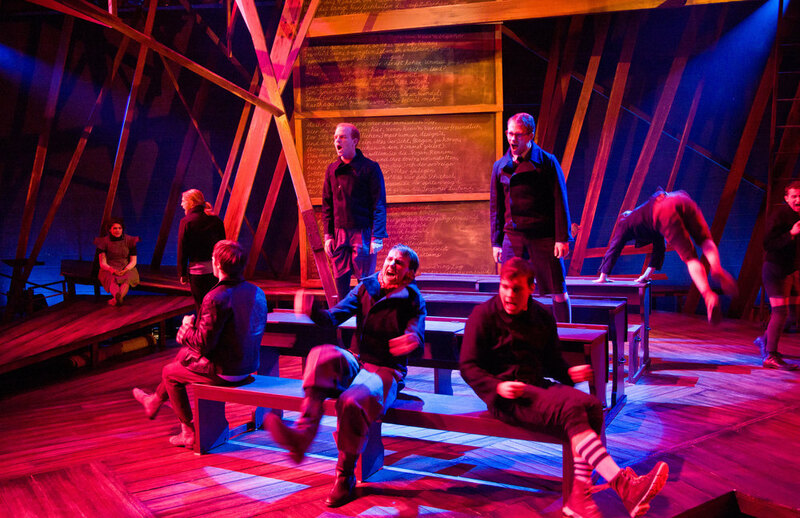 Spring Awakening is a cautionary tale of what happens to children when parents willfully turn their backs on communication, and treat difficult questions with hostility rather than honesty, leaving their children to struggle through adolescence alone. Although it is set in late 19th Century Germany, the themes of angst, strife and the burgeoning sexuality that youth experience are universal. A tangle of beams splay out over the rough hewn floorboards creating an asymmetrical canopy for the youth. They tell their story against the backdrop of vertical planks giving them places to hide and linger as they act as silent witnesses to the unfolding tragedy. The lighting of Spring Awakening lives in three worlds: the present moment, the internal world of the youth and the rare moments of connection where the emotions of the daydream brush against reality. The present, as exhibited in scenes like the school, is harsh and oppressive. Students are forced to fill roles designated by adults and are left no room for self-expression or personal freedom. The chilly gaze of authority continually peers down on the youth in the form of a blinding spotlight, eager to curtail trouble before it starts. In contrast, the internal world of each student is vivid and visceral. Music, like their feelings, overtakes them, obliterating the oppressive world of the present. Colors are bright, explosive and, at times, almost overwhelming as the students wrestle with their feelings and sense of abandonment by adults. It is in this internal world where we are able to glimpse at who these students truly are, uncensored by the harsh judgement of their parents. Connection is fleeting and rare in the world of Spring Awakening. These rare moments span the gap between the two worlds of the play. These are fragile, tender moments when two souls are able to briefly share the burden of pain or the blossoming of romance. Here the bleak world they normally live in begins to soften at the edges, tinged by the colors of their emotions. Ultimately, it is these moments that the parents attempt to avoid entirely. At the end of Spring Awakening we are not left with a neat package where all the ends are tied together. Two children died because adults refused to address difficult subjects, yet one student remains who is willing to carry those experiences with him. Here the present begins to warm softly as the winter the students were continually living in begins to melt and the first blooms of spring become evident. It is not a happy ending, but the potential that one might one day come.